Istanbul’s Blue Mosque is the city’s crowning glory, built in the early 1600s on a significant piece of land right in front of Hagia Sophia. 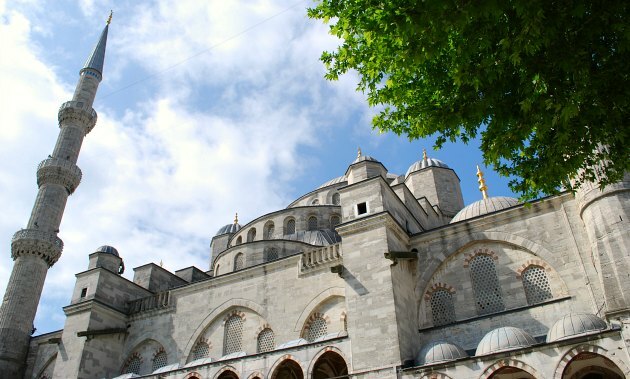 The location is significant because it cements the supremacy of Islam in the Ottoman Empire, overlooking the former Basilica and on the site of the former Byzantine palace. Also, from here, the striking 6 Minarets can be seen from across much of the city. From the outside you can see the large main dome, but also how the many sub-domes were constructed to support it. From Sultanahmed Square, it looks particularly impressive as the sun sets. The mosque welcomes visitors as long as prayers are not taking place. Follow the signs to the visitors entrance where you will be provided with appropriate coverings if you are not dressed correctly to enter the mosque. Out of respect, we decided to dress appropriately which is no shorts, no knees or shoulders on display and a headscarf for women. You will also need to remove your shoes. 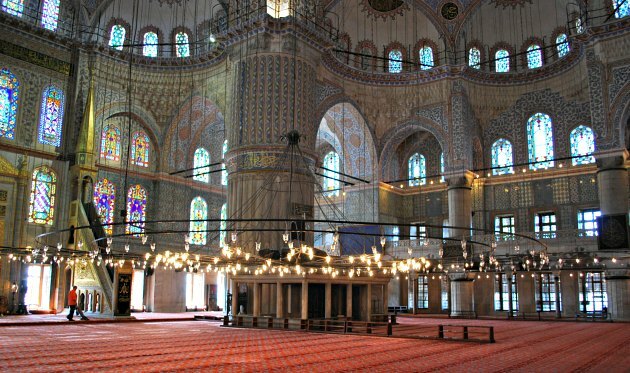 Although the official name is Sultan Ahmed Mosque, the term Blue Mosque has stuck and the moment you step inside you can see why. 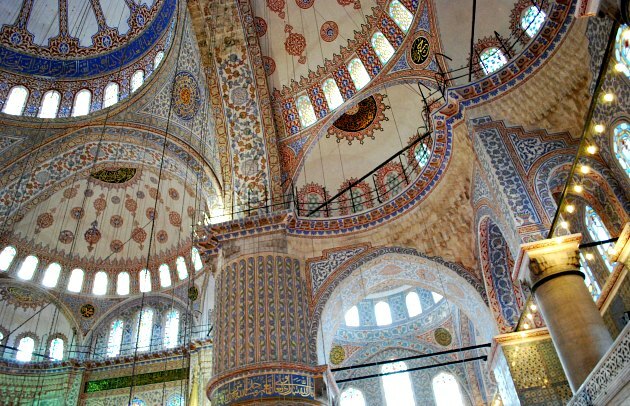 The decoration of the domes and walls is stunning, made up of painted designs and blue ceramic tiles. 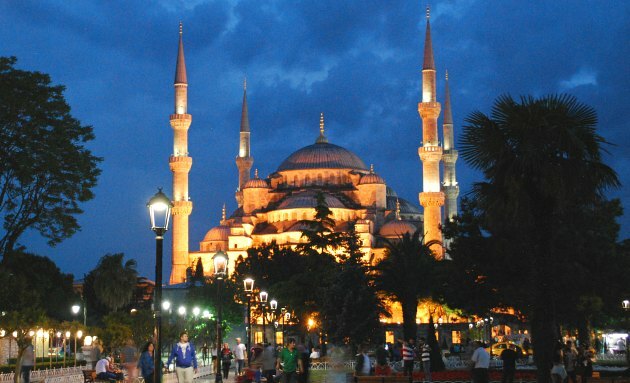 The Blue Mosque has a large area sectioned off for visitors and you are free to take photographs and soak up the beauty and tranquillity of the place. There are a number of features to look out for inside including the Minbar, with its long staircase, from where the imam delivers his sermons. Also the Mihrab, which is the decorated niche which points towards Mecca. The large modern carpet allows prayers to take place in comfort. If you don’t know much about Islam, it’s worth picking up the free pamphlet on the way in which explains more about the religion and the features of a mosque. 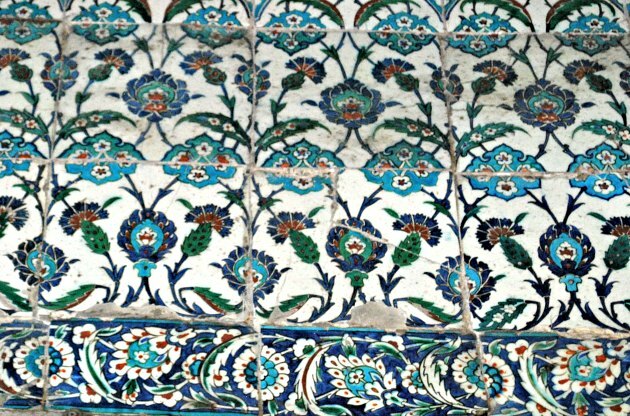 From a distance, it’s not obvious how much of the interior is made up of painted tiles, so spend a bit of time letting your eyes focus on individual areas and you’ll soon see just how many tiles there are inside and how much detail they display. On close inspection, many of them are also showing their age, which adds to the character and history of the mosque.